Ever wonder what Andy Warhol’s Marilyn Diptych would taste like as a cocktail, or Keith Haring’s colorful dancing figures in the Pop Shop series? Now’s your chance to drink iconic art at 213 Hospitality and Proprietors LLC’s Honeycut. 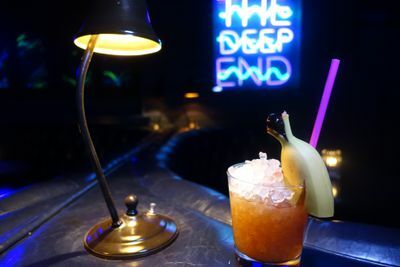 This month the Downtown bar’s Deep End cocktail lounge debuted a new 19-drink menu, each inspired by four modern artists. But we’re not talking a gimmicky, superficial theme here. 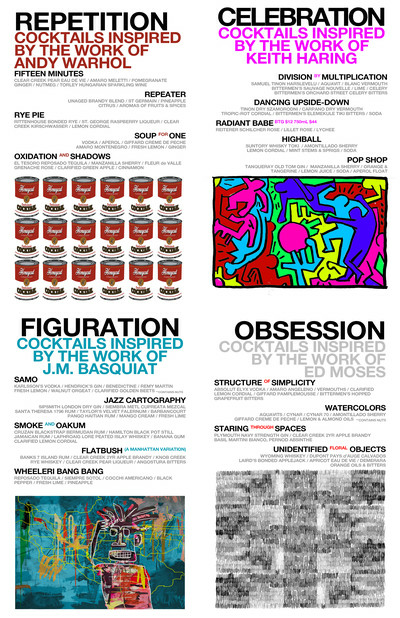 Don’t expect cocktails served in Campbell soup cans, but rather flavors and styles that emulate the artists’ spirits. Instead, think “Repetition” for Warhol, “Celebration” for Haring, “Figuration” for Jean-Michel Basquiat and “Obsession” for Ed Moses. “We tried to choose a singular word that would best describe each of the artists,” explained drinkmaker Dave Fernie. This approach to menu creation is very similar to how Proprietors LLC does it at Walker Inn, their award-winning Koreatown bar. Bartenders Fernie, Alex Day, and Matt Brown translate these high-level concepts into different cocktail styles, then work up the results into a fun, engaging new menu. The Warhol cocktails are colorful, refreshing and fruit forward. Haring’s are quaffable and low alcohol, while Basquiat’s come off as flavorful and worldly. 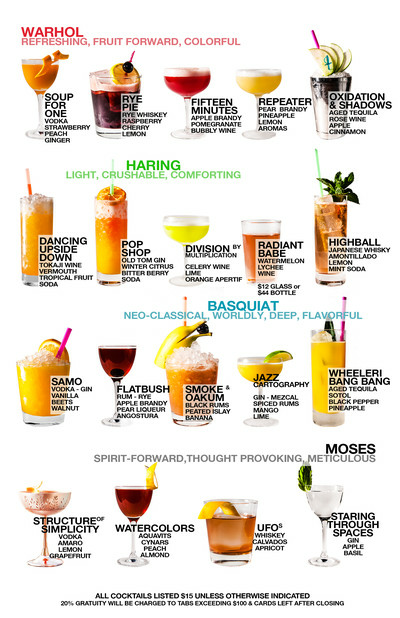 For his part, Moses’ cocktails are intense and spirit forward. “I think introducing people through five impressions is easier than trying to share with them on a deeper level what the art is supposed to mean,” Fernie says. Here are four options from the series that you can try right now — plus a slushee. Since LA’s abstract expressionist Ed Moses (aka 213 Hospitality founder Cedd Moses’ dad) is known for creating a large piece made up of meticulously crafted individual parts, the team focused on simplifying cocktail recipes down to a minute detailed level. “Let’s pick the most easy-to-obsess-over style of cocktails and try to recreate them in a way that is not only at least mildly familiar but also let’s make them so that we think they’re better,” says Fernie. For something intense, order the martini-esque Staring Through Space. Take in that gorgeous herbaceous scent and then sip. It may be a little too much for occasional drinkers as it’s pretty spirit forward thanks to that navy-strength gin and apple brandy. But that initial booziness is followed by bitterness and then a subtle minty finish. An elegant sipper to end the evening. For Haring, the throughline of his work, according to Fernie, was that while it’s easy to digest, there’s always a deeper message. Thus the Haring-inspired drinks are quaffable, with low ABV and an eye toward sustainability. Leaning on more sustainable bar practices, their new Dancing Upside-Down uses a housemade “tropic rot” cordial created from the bar’s unused garnishes and juices, and can also be enjoyed as a soda. 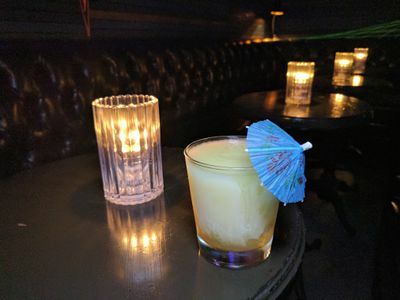 In the sherry-based cocktail, the cordial carries the flavors from nutty to tropical fruit, making the result a refreshing and dry Tiki-esque drink. The Jean-Michel Basquiat cocktails are exactly how you’d think the New York neo-expressionist’s works would taste: dense and deep, with a sense of “terroir.” “We tried to make as much of it just creating these dense flavors that weren’t too challenging but reminded you of something else and felt primitive but also really deep,” says Fernie. As the artist often incorporated his Haitian background into his art, the drinks showcase ingredients like Haitian rum, mango cream, and banana gum. A standout cocktail is the Smoke and Oakum, a rich, heady take on the Jungle Bird — a simple five-ingredient 1970s Tiki cocktail. It’s super molasse-y and warm, but then finishes bright thanks to that lemon cordial. And if you’re skeptical about peaty scotch and banana going together, don’t be. They actually love each other. Since repetition and a focus on mundane beauty are Warhol’s M.O., the bartenders chose iconic classic cocktails and then took them in a different direction. So here you’ll find the Fifteen Minutes champagne cocktail but with pear eau de vie and pomegranate ginger. The Rye Pie is a whiskey sour but with raspberry liqueur and cherry brandy. And the Soup for One is a funky Cosmopolitan with creme de peche and amaro. Start of the night with any one of these but especially the Oxidation and Shadows. Its mix of reposado tequila, sherry, and grenache rosé come together to create a light and refreshing julep with vegetal notes. 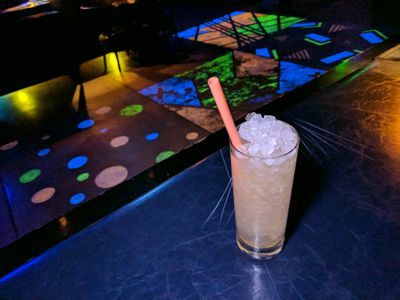 This slushee cocktail, which breaks in the bar’s new slushee machine, isn’t part of the artsy series but did launch with the menu. The heat from the chile, fortunately for spice wimps, shows up as initial pepperyness and quickly dissipates leading into a refreshing finish. But if you like it uber spicy, you have the option of adding up to five drops of fiery-hot hellfire bitters. Fernie recommends going with three drops, however. If you’re not familiar with any of these artists, not to worry. The menu, which resembles the fold-out guide for New York’s Whitney Museum, lays it all out for you. In it the cocktails are broken up into the four artist categories. There’s also an illustrated guide depicting each drink along with a list of their ingredients, which leaves out fussy brand names. Fernie says the menu will be available for six to eight months, which means you’ve got time to seek them out. Don’t wait forever, though: this is the sort of thoughtful and well-conceived cocktail menu you’d normally find at an intimate craft cocktail bar like Walker Inn, but done in a high-volume cocktail bar/dance club. Impressively, they still manage to pull off such intriguing, multi-layered drinks with a next-level concept for the masses. 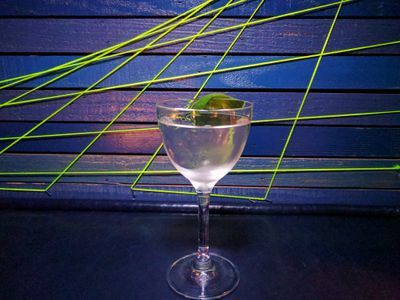 “Explore the Art of the Cocktail at Downtown’s Honeycut.” Eater LA – All. 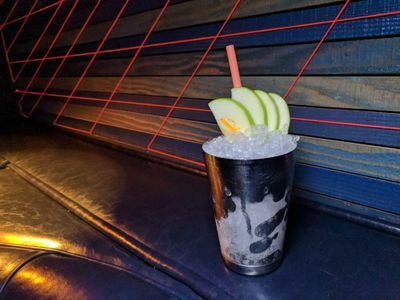 http://la.eater.com/2017/1/19/14168424/honeycut-artsy-new-cocktail-menu.